The Army will be bringing one of its most impressive battle tanks to Coleraine on Saturday, June 23. The 62-tonne Challenger 2 will be on display in Christie Park as part of the town’s Armed Forces Day celebrations. Thousands of people are expected to attend the regional showcase celebrating the ongoing commitment of troops, their families, veterans and cadets. “We are working closely with our partners in the Ministry of Defence to create a spectacular event for everyone to enjoy. “The Challenger Tank showcase will provide an unforgettable sight and it is a real privilege for us to welcome it to Coleraine,” a spokesperson for Causeway Coast and Glens Borough Council said. Visitors can also look forward to getting up close with a Gazelle helicopter, while the Royal Navy is bringing its P2000 patrol vessel to the River Bann. Pipe Major Wallace 152 (North Irish) Regiment The Royal Logistic Corps along with Major JD Taylor and cadets Athena Dunlop and Laura Pipinska helping promote Armed Forces Day in Coleraine on June 23. 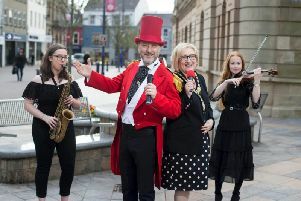 A gun salute will signal the start of a packed programme of family-friendly attractions and live music in Christie Park and throughout the town from 12:30pm – 5pm. The opening parade will see hundreds of service personnel and veterans pass through the town before a Drumhead Service in the Diamond. The event will come to a close in spectacular style as the world renowned Band of the Royal Marines parades through the town before leading the Beating of the Retreat. The free event will also feature live music and dance with ‘Rhythm of the Bann’. A park and ride facility will be available at Rugby Avenue from 8am – 9.30pm. For further information check out the council’s social media pages.